Jan 2017, Boulder, CO – Two of GeoVisual’s technologies were featured in separate articles in NASA’s premier publication, Spinoff, which profiles NASA technologies that have transformed into commercial products and services. The 2017 edition features an article on the origins of GeoVisual’s CLIP machine learning platform for agriculture and another on GeoVisual’s OnSight mobile app and web services for global detection and prevention of rainforest fires. Each year, Spinoff highlights NASA technologies that are benefiting life on Earth in the form of commercial products. About 50 spinoff technologies are featured annually in the publication, demonstrating the wider benefits of America’s investment in its space program. NASA has profiled nearly 2,000 spinoffs since the publication began in 1976. 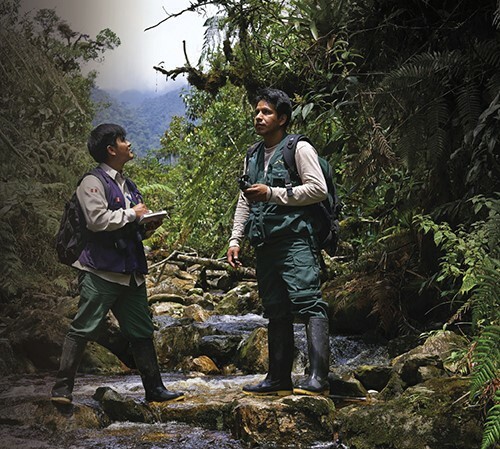 Park rangers patrol the Alto Mayo protected forest in Peru. There and in Madagascar, Conservation International is incorporating the OnSight platform, which GeoVisual Analytics created with NASA funding, into Firecast. OnSight lets patrollers on the ground make observations to validate and augment fire data from satellites.